Ben Carson, a gentle salamander with a tremendously odd manner, isn’t doing so great, campaign-wise, having just cut 50 staff jobs, or about half of his campaign staff. But he does have clean suits, which seems to be quite important to him. That news comes a day after Carson defended himself for going home to Florida after the Iowa caucuses, where he came in a distant fourth. His rationale: laundry, a thing which can only be done in Florida. 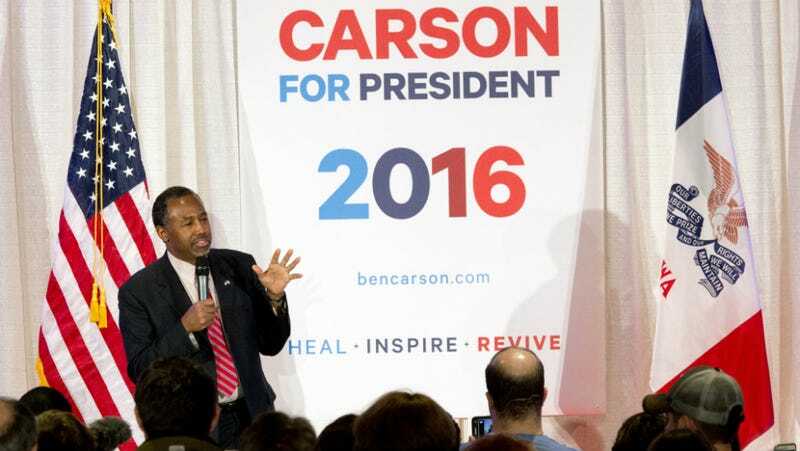 Carson asked if his desire to fetch new suits at home makes him “an evil, horrible person”? Carson’s campaign has insisted he’ll return to the trail soon but for two days after the Iowa caucuses declined to issue a schedule of public events for the candidate, other than to say he’d be spending time Wednesday in Washington and North Carolina. Breaking News. The press is reporting that Dr. Ben Carson is taking time off from the campaign trail after Iowa and making a big announcement next week. Please inform any Carson caucus goers of this news and urge them to caucus for Cruz. Carson previously called that email a “dirty trick,” and has argued repeatedly this week that his desire for homebrewed laundry shouldn’t be held against him. Carson stuck with the “fresh suits” excuse there too. We all have our weird, emphatically stressed priorities.